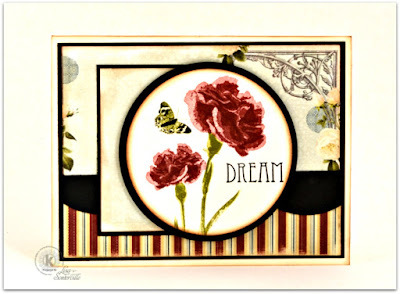 Designs by Lisa Somerville: Kitchen Sink Stamps New Releases NOW Available! Kitchen Sink Stamps New Releases NOW Available! Happy Kitchen Sink Stamps Monday! The wait is over, there are FOUR new sets available in the Kitchen today! Before I share the details on the release, I wanted let you know there is a special sale for my blog readers simply click here or enter code LISA20KSS when shopping at Kitchen Sink Stamps, and you can save 20% on all your purchases, you'll also receive FREE Shipping when your order totals $65 or more! This special 20% off sale is only valid through July 6, 2015 Midnight PDT. Don't worry, if you are reading this at a later date, you can always save 15% by clicking here. Today, I'm sharing a card I created with the new Multi Step Carnations stamp set. I just love these new floral images! Here I paired them up with a sentiment from Vintage Words. BEAUTIFUL!!!!! I am SO excited that KSS is back up and running again! Love how you used and framed these flowers! Wow, I love everything about this pretty card. That carnation is going on my wish list. Gorgeous card and love the colors.